Home / Columnists/ Mediocrity and ethnic rivalry: A toxic combination in University of Jaffna? 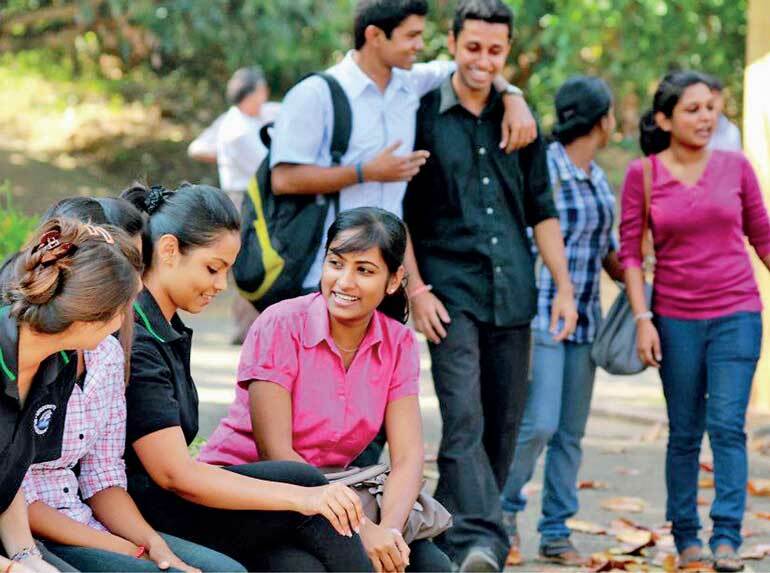 Mediocrity and ethnic rivalry: A toxic combination in University of Jaffna? ‘Patriotism is the last resort of the scoundrel’ is a quote attributed to Samuel Johnson. When university students clash over ‘my parochial dance form’ over ‘your parochial dance form’, I think it is time for a new version of the quote – Preservation of culture is the last resort of a mediocre intelligentsia. The clash between Sinhalese and Tamil students in the University of Jaffna about a Kandyan dance routine in their welcome ceremony for freshers is not a conspiracy as extremists would claim, but only a symptom of mediocrity of faculty and student body across our campuses, I would surmise. Don’t get me wrong. I am as emotional as another Sinhalese when it comes Kandyan dancing. The recent Sinhala movie ‘Sakkaran’ by Dharmasena Pathiraja, or the book by the same name, documents the caste issues and the exploitation that were part of the Kandyan dance tradition. Notwithstanding that historical baggage, I am moved every time I see a Kandyan dance performance. I have grown up with those drum beats and dances and it is a part of my cultural DNA. I don’t know much about the traditional Thavil and Nathasvaram performance that Tamil students would swear by. If I was a Sinhalese student in in Jaffna, I would certainly make it an opportunity to learn more about and enjoy the Thavil and Nathasvaram ensemble and eat lots of fiery crab curry. Jaffna peninsula has always been a unique environment and I cannot envision a Kandyan dance routine in the palmyrah-dotted landscape there, unless natives wanted it. In fact, I see a problem with any parochial processions inside the university unless the intention is to assert academic values and/or to reinvent traditional forms. The first guiding principle in the European ‘Magna Charta Universitatum’ of recent times is “The university is an autonomous institution at the heart of societies differently organised because of geography and historical heritage; it produces, examines, appraises and hands down culture by research and teaching”. Jaffna is indeed a differently organised society because of geography and historical heritage. Yet, are the University of Jaffna academics and students capable of examining, appraising and reproducing the peninsula’s culture through research and teaching? From what we have seen so far, they are not. Is the leadership in Colombo any more enlightened? Did they do their part to sensitise the Sinhalese students moving into a uniquely Tamilian culture? Do the rest of the academics in the country have the openness of mind that we expect of academics? Walk into any other public university campus and you see efforts to recreate the village inside and hide behind a façade of cultural correctness. Our academics and students talk the big talk that they should be funded and maintained at taxpayer expense to educate future generation of leaders, but are they equipped to do that? Are they able to stay above the fray or do they even have a clue that they should? 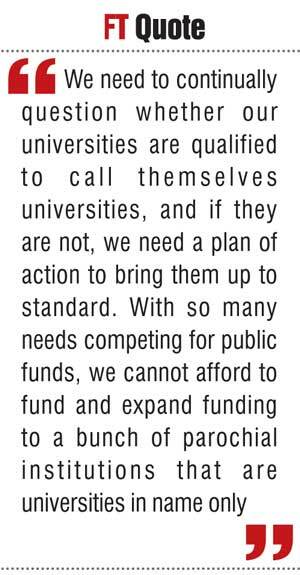 We need to continually question whether our universities are qualified to call themselves universities, and if they are not, we need a plan of action to bring them up to standard. With so many needs competing for public funds, we cannot afford to fund and expand funding to a bunch of parochial institutions that are universities in name only. The Magna Charta Universitatum is a document that was signed by heads of universities from all over Europe and beyond on 18 September 1988, the 900th anniversary of the University of Bologna. There are three guiding principle of which the first was mentioned earlier. This charter was the basis for the alternative white paper produced by the Convention for Higher Education as a response to what they call a managerial values driven white paper by the Department for Business, Innovation and Skills (BIS) of UK. Unfortunately, John Holmwood (University of Nottingham), Tom Hickey (University of Brighton), Rachel Cohen (City University London) and Sean Wallis (University College London) who wrote the paper do not once talk about the massification of higher education that is a reality now across the world and its implications for ideals of higher education. In fact the institutions these authors represent are part of the massification issue when they were converted in 1992 from polytechnics to ‘Red-bricks,’ a reference to more egalitarian universities established in UK in the late nineteenth century and later. As I pointed out earlier (http://www.ft.lk/article/552940/Education-and-social-mobility--A-broken-link? ), the education gospel or the notion that more schooling for more people is the remedy for all our social and economic problems has taken root in society, but the falsity of the gospel is beginning to be exposed. More people may gain the qualifications previously required for professional or managerial jobs, but, if the number of these jobs do not expand to meet the supply of qualified people, the exchange value of the credential weakens, leading to credential inflation. This causes what one might call the opportunity trap for them middle classes where they find they have to keep running to stay abreast. Some even find themselves falling behind. The angry masses in USA behind the rise of Trump and in the Brexit campaign in UK are cases in point. The truth of the matter is that higher education is not just any tertiary education. Higher education is an elite form of tertiary education for those with the inclination to pore over books, engage in intellectual debates and question and re-question assumptions, never tiring of it, I believe. It is like any other creative endeavour. We think nothing of artist or authors starving themselves while creating masterpieces while many fall by the wayside. However, with governments’ funding and institutionalisation as universities, intellectual work has come with job security and pensions. Due to demand from parents and students institutions calling themselves universities have mushroomed, with many mediocre ones in the midst. In our little in world in Sri Lanka, faculty and students in public universities are demanding that state takes over the private institutions and make more replicas of public institutions. These students and faculty clamouring for broad-basing of public higher education clearly do not care about quality or have a notion of quality. Compulsory basic education age has been increasing over the years for 14 to 16 and now with UNP’s policy of keeping students in school until 18 years of age, the State’s commitment has increased to 18 years of age. This is alright because it is in the interest of society to have youth entering adulthood at 18 better equipped. The problem is what happens beyond 18. We have 320,000 youth turning 18 every year. We know that 4% are likely to be in a public university and 3% in technical education or vocational training (TVET) funded by the State. Those who gain access to public higher education have no further obligations. You can receive a medical or an engineering degree free of charge and leave the country next day or pursue private interest without owning a cent to the taxpayers. This is an untenable situation in the context of 93% of their peers not receiving any support from the State. One solution is to give an assurance of one year of further education to all who turn 18, for a recognised course of study or an apprenticeship. Many young people, complete one year of education and support themselves for further education. Why not make it the norm? Highly-selective higher education for a few? In an ideal scenario, students entering higher education and their teachers would be engaged in inquiry based learning from day one. There is much talk about use of technology in education, but nobody has come up with a system to replace a good teacher working with a few committed students. How many students per teacher? The number of students that Plato or Aristotle or Gurus known Dispamok in India had at one time under their care would be a guide. Such an education would be expensive. Even now we select 4% of youth, but we don’t give them the facilities, curricula or teachers they deserve. If we care about higher education in Sri Lanka, we need to maintain or reduce the State-funded opportunities, put more money into existing institutions and enforce accountability of faculty to educate themselves before they call themselves educators. Public higher education should be an exemplar for private efforts which other youth would pursue, taking the risk returns to investments into their own hands.